CS diagrams visualize controllers, controlled processes, control actions and feedback. Add new elements to diagrams or modify already existing elements on your diagrams. CS Diagrams reside under a CS Model and the STPA Module supports multiple diagrams for one CS model. All elements, with the exception of annotation elements, that are created on a diagram are stored as part of the respective CS Model. Select the CS Model for which a new CS Diagram is to be created for in the STPA Project Overview panel. Click the icon to create a new CS Diagram. Alternatively, you can create a new diagram by right-clicking the Model to open the context menu, then selecting the New Diagram. 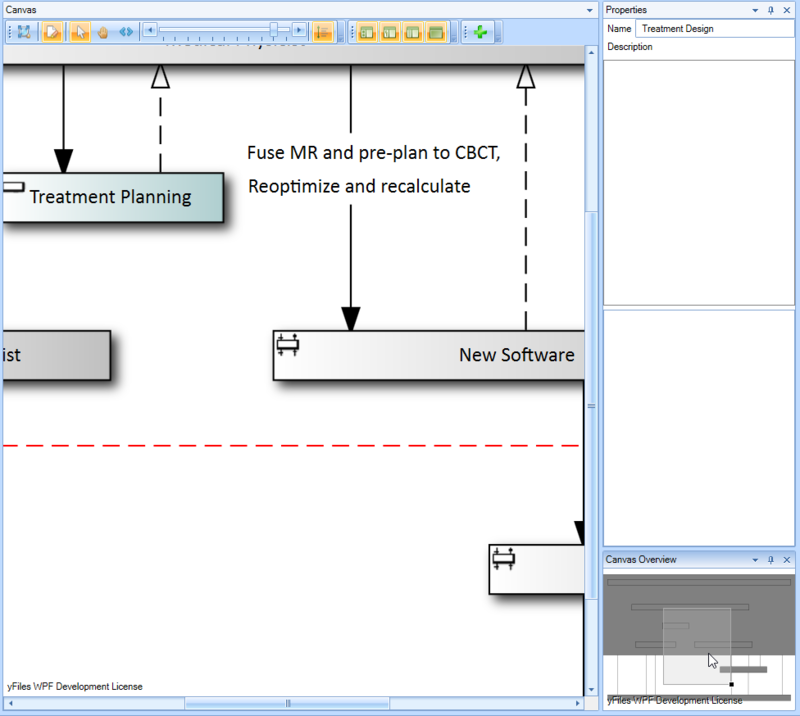 Double click New Diagram under the Model to open the canvas and panes in the workspace. 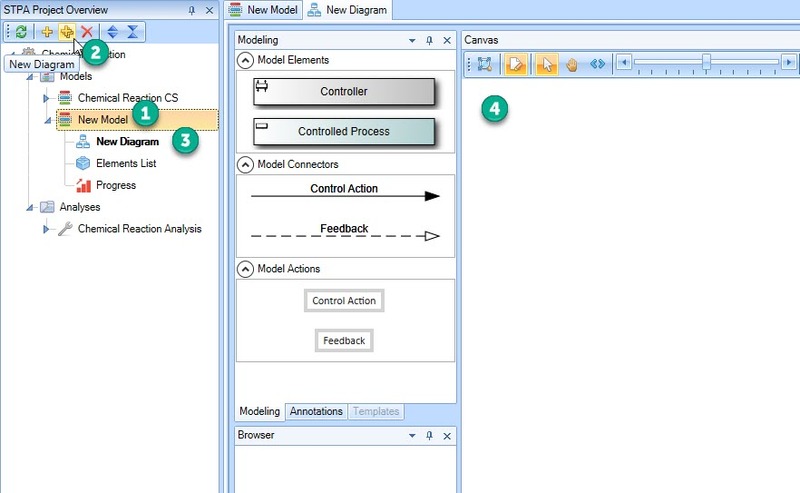 Use the canvas by selecting-dragging-dropping Model Elements and Model Connectors on the canvas to create the Control Structure. You can save your progress now to allow the name to save for the tab and in the tree (Ctrl+S or save icon at the top-left). Name the New Diagram using the Properties pane on the right side of the canvas. A Description can also be entered in the Properties pane if desired. 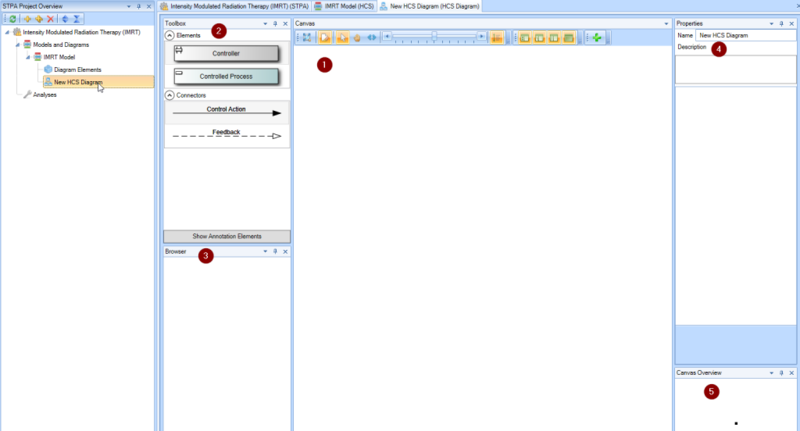 The user interface for Models and Diagrams provides the following work areas as default docked panes. All of the panes can be rearranged, floated, resized, added or removed as the user prefers. The Canvas is displayed in the center and it is used for modelling the CS diagram with the “Diagram Elements”. The canvas also contains a Canvas Toolbar to aid in the customizing of the panes, including a zoom in/out scale for the canvas. The Toolbox on the upper left-hand side of the canvas contains the Diagram Elements and Connectors for use on the canvas via ’Drag and drop’. The Browser on the lower left-hand side of the canvas shows the relationships of the currently selected element on the canvas. The Properties panel on the upper right-hand side of the canvas shows the properties of the currently selected element on the canvas. The Canvas Overview on the bottom right displays the complete Diagram in a miniature form, while highlighting the visible area of the canvas and providing a pan and zoom function. Note: The screenshot shown above, along with the described locations of the individual panels, represent the default positions. Un-docking, relocating, and docking in a new position is allowed and easy to do. The STPA Module provides several ways to scale the visible area along with pan and zoom around the diagram canvas. The Toolbar of the Canvas provides a sliding scale for the canvas to adjust the size of the viewing area. Use the scroll button on your mouse to enlarge or shrink the canvas viewing area (zoom in/out). Another great way to move around the canvas when your diagrams get to be large is to hold the ‘Ctrl’ key and the left click button to “grab the canvas”, then simply move around as you like. Release the left click button to set in place. Inside the Canvas Overview you should notice a grey, shaded box that represents the canvas viewing area. Again, use the scroll button on your mouse to enlarge or shrink the canvas viewing area (grey box within the Canvas Overview). Use the left click button to grab the grey box in the Canvas Overview and move around the canvas. Release the left click button to set the viewing area on the canvas.